I have spools and spools of ribbon that are just completely out of control. It seems they are stashed everywhere. When I need a particular color, I have no idea where it is--some box, bag or drawer, somewhere...I have been wanting a ribbon organizer for some time. Something large enough to hold all my ribbon. I have seen some really great organizers on Pinterest. I have collected a few of the ones I really liked. Even e-mailed the instructions to my husband, hoping I would come home one day and there they would be! :) No such luck. I went to my local craft store and purchased 3/8" wooden craft dowels. The holes were drilled 3/4" up from the bottom shelf. I bought the long rods, so they could just be pushed in and cut it off where needed. He pushed them in and glued them in place. That's it. I have two side-by-side. I can now put my ribbon in by color and see immediately what I have. At least for the spools that fit. I do have some that are very large and won't fit inside. But they work on my older, smaller one. I love it! Congrats on your ribbon organizer! Isn't Pinterest awesome? I am your newest Pinterest follower! Stopping by from Inspire Me Monday! Great idea! I need one now! Awesome Organizer! I am also a huge Pinterest Fan. I'm addicted.lol. Found you via a blog hop and am now a new follower! 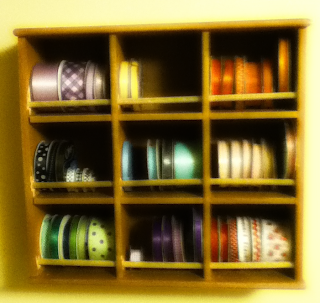 it's so nice to have great storage for stuff like ribbon. and yes, pinterest is a great place to find ideas! I have an entire craft room and yet my ribbon is still shoved in a shoebox. I think hubby will have to build me one. this is a great idea. Whenever i need ribbon it is always wrinkled or creased because it's been shoved into a drawer! This is a great way to keep them all neat and right at your fingertips!